This specific character was created for the What Else? play-by-e-mail RPG campaign. It used an amalgam approach for the Player Characters . Real Name: Thor / Donald Freedman. Amalgam Of DC’s Captain Marvel Jr., DC’s Firestorm, and Marvel’s Thor. The Captain Marvel Family in [this version of the] Amalgam Universe is a religion-based group. There is a Captain Marvel for each culture, group of deities, or religion in the world. 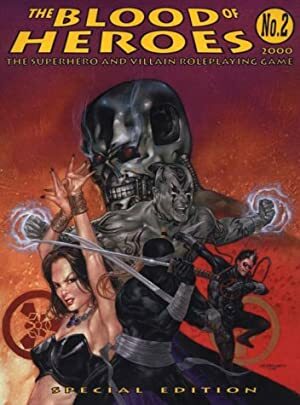 It is not known how many Captain Marvels exist, though two have gone public: Marvel Woman, the Amazonian/Olympian Marvel, and Captain Thunder, the Norse Marvel. To be a Captain Marvel, one need not be religious or even follow that religion. 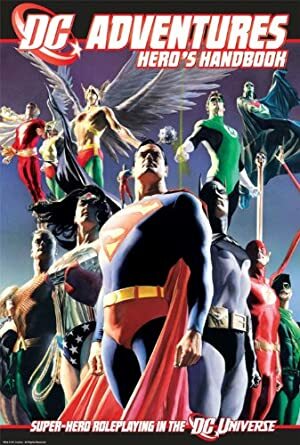 They are specifically selected by a deity or group of deities that have proven themselves to the entity known as Arion Shazam. This powerful entity, also known as The Wizard Shazam, will give each ’pantheon’ a champion. The Norse Champion was chosen recently. He was to embody the essence of a son of the Norse Allfather Odin, and the power of Shazam. Donald Freedman, a crippled sculptor/art teacher and a reincarnation of Thor, was chosen for this task. Summoned by Odin and Shazam, Donald realized his responsibility. He was bequeathed with the mighty, weather controlling, returning hammer, Mjollnir, whose inscription reads “Whomsoever can raise this Hammer is worthy of the Power of Shazam”. Donald is a man of average height, about 6′, though he looks shorter. After an accident at a construction site years ago, he has to walk with a brown crutch under his arm. Donald is in his early 30s and teaches Sculpture at Monroe University in New York . He’s also the Faculty Advisor to the local Role-Playing Game club. Donald is a blond, slightly handsome man, who tends to wear flannel shirts and jeans, or slacks. He doesn’t like to wear shorts because they make him feel self-conscious – especially since his accident. Captain Thunder is the Marvel incarnation of Thor the Thunder God. He is big, very big. In fact he’s almost seven feet tall, and quite wide. Captain Thunder is a very built, blond Norse man. 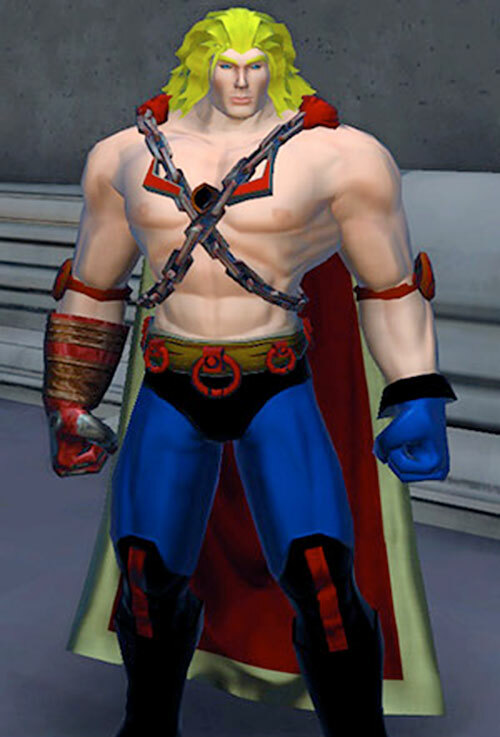 Captain Thunder’s costume includes two black straps across his chest, two disks on each angle. In the center of his chest is the symbol of Arion Shazam, and his own symbol, the Thunderbolt. He carries Mjollnir, his fabled hammer, which always returns to his hand. His skin-tight pants are blue and he wears large, black boots. 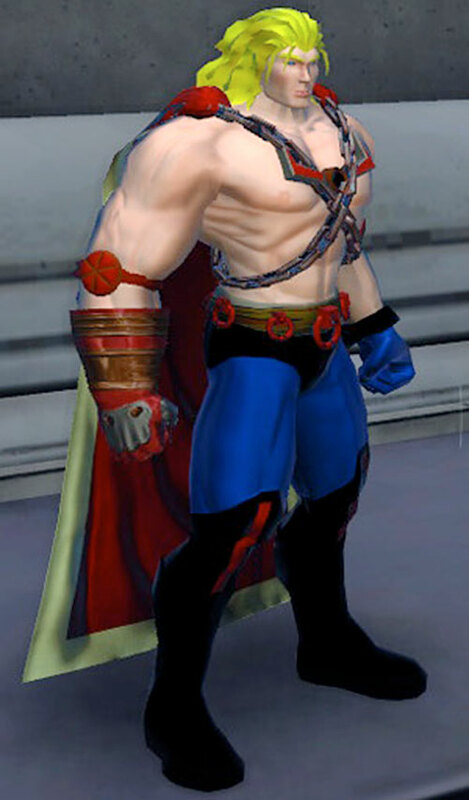 His chest is very prominent and is almost fully exposed, but his back is covered by a large red cape with golden trimming. He enjoys getting into his work, but really likes being Captain Thunder because of his desire to walk again. He speaks with a prominent accent, though it’s unsure if he has to. Thunder talks of wenching and pillaging with pride and joy. No one is sure if this is Donald talking or not. Insta-Change, Lightning Reflexes, Attractive, Misc. (can mentally talk to his alter ego, Donald, for advice). Secret Identity, Alter Ego (Controllable),Catastrophic Rage, MIA (Being in Avatar form because he can walk), MPI (Speaks as though he really is a Norse god), Unluck, Arch Enemy (Black Loki), Power Of Shazam (see below). Mjollnir [BODY 08, AV: 10, EV: 10, Gliding: 06, Weather Control: 12, Bonus: In Human form, the mighty hammer becomes a humble crutch]. Must be able to shout “Shazam !” loudly and clearly. Multiple users of the Power Of Shazam each receive a -1 CS to one ability for each additional user. When a second user activates the power, the first user loses 1 AP from the first ability in the list below. Should a third user also activate the power, the second user will lose 1 AP from the next ability in the list, and so forth. Should enough users appear to “wrap” the list, an additional AP is lost from the next ability by the first user. The abilities, in order, are: STR, BODY, DEX, Superspeed, Flight. Activating the Power Of Shazam allows other users in the vicinity to sense the activation, whether they are in human or Avatar form. Scholar (Radio), Attractive, Misc. (can mentally talk to his alter ego, Thor, for advice). Secret Identity, SPR (Has to walk on crutches). Helper(s): Compiled by Scott RC Smith and JD. Illustration by Sébastien Andrivet using the Champions Online generator.